After 3 rounds played we can already see who rules in the State League and who belongs to weaker ones. The round was exceptionally exciting as six games ended with a tiny margin. There was no lack of interesting games this round. The round ended with loss of the undefeated team, favorites losing the games and games ending by tiny margin. Here is the last round review presented by ESL. The most crucial game of the last round was a loss of Thunder (1-1) in McKinnon on Saturday night. Visitors were edged by Cougars (1-0) 83-80. They made 17-of-20 free shots (85.0 percent) during the game. It was a great evening for American forward Dillon Stith (200-92, college: St.Vincent) who led his team to a victory scoring 26 points and 5 rebounds. Adrian Tomada helped adding 16 points and 9 assists (went 10 for 10 at the free throw line !!!). The best for the losing side was B Symons with 24 points and 6 rebounds. Cougars are looking forward to face Cavaliers in Cranbourne in the next round and it will be quite challenging to get another victory. Thunder will play at home against Stingrays (#8) and is hoping to prove to their supporters that this time they can win. Very significant was Hume City Broncos' (#6) 23-point road victory against Stingrays in League 114-91. It was an exceptional evening for naturalized American forward Jake Martin (198-93, college: Luther) who led the winners with a double-double by scoring 21 points and 16 rebounds. Jamal Shabazz accounted for 21 points and 13 rebounds. American center Joe Reid (205-91, college: Shaw) came up with a double-double by scoring 31 points and 11 rebounds for Stingrays in the defeat. The winner was already known earlier in the game, so both coaches allowed to play the bench players saving starting five for next games. Hume City Broncos will play against Gulls (#7) in Melbourne in the next round. Stingrays will play on the road against Thunder in Melbourne and hope to get finally their first victory. Quite upsetting was Vikings' (#1) 29-point home defeat in a game versus Cavaliers who smashed hosts The best player for the winners was Raheem Lemons who had a double-double by scoring 24 points and 11 rebounds. At the other side the best for losing team was Jake Heath who recorded 27 points and 9 rebounds. Since the result was very predictable, it gave the chance for the coaches to test many bench players which allowed the starters a little rest for the next games. Cavaliers will meet at home Devils (#9) in the next round and are hoping to win another game. Vikings will play against Magic in Hawthorn and look forward to get finally their first victory. And what about another game where Magic (#5) beat Gulls 90-82 on the road. It was a good game for Patrick McBrearty who led his team to a victory with 26 points. Gulls' coach rotated ten players in this game, but that didn't help. Magic's next round opponent will be Vikings (#6) in Melbourne. Gulls will play on the road against Hume City Broncos in Tullamarine and look forward to get finally their first victory. Crusaders' road win over Canberra Gunners 74-59 was very exciting. It was a great evening for Mitchell Rueter who led his team to a victory with a double-double by scoring 26 points and 11 rebounds. Canberra Gunners' coach tested ten players and allowed the starting five to rest. Crusaders will face Sutherland Sharks (#6) at home in the next round which should be theoretically an easy game. Canberra Gunners will play against Manly Warringah Sea Eagles and hope to win that game. In League winless Werribee D. were destroyed by Keilor T. on the opponent's court 92-64. Winless S.Adelaide P. lost to undefeated W.Adelaide B. in a home game 66-95. Winless Southern T. recorded a loss to Mt Gambier on the road 99-108. Eastern M. defeated Woodville W. on its own court 94-77. Forestville E. smashed C.District L. in Goodwood 138-82. Norwood F. won against N.Adelaide R. at home 82-81. Winless Sturt S. lost to undefeated W.Adelaide B. on the opponent's court 76-90. Kalamunda E.S. was rolled over Goldfields G. in a home game 65-98. Joondalup W. crushed Perry Lakes H. on the road 112-76. Lakeside L. beat Mandurah M. on its own court 80-77. Willetton T. won against Cockburn C. in a road game 90-81. Geraldton B. managed to outperform Rockingham F. at home 86-70. Goldfields G. lost to undefeated Joondalup W. on the opponent's court 83-91. Winless SW Slammers lost to undefeated East Perth E. in a home game 98-108. Kalamunda E.S. beat Mandurah M. on the road 82-75. Winless Perth R. lost to undefeated Warwick S. on its own court 61-96. Winless Newcastle H. lost to undefeated Penrith P. in a road game 62-65. Bankstown B. managed to beat Hornsby S. at home 82-75. Winless Sydney Comets was defeated by Manly Warr. on the opponent's court 80-79. Sutherland S. beat Maitland M. in a home game 69-68. Norths Bears won against Hills H. on the road 70-66. The most impressive stats of the last round was 35 points (!!!) and 6 rebounds by David Humphries of Goldfields G.. The most crucial game of the last round was a loss of Thunder (1-1) in McKinnon on Saturday night. Visitors were edged by Cougars (1-0) 83-80. They made 17-of-20 free shots (85.0 percent) during the game. It was a great evening for American forward Dillon Stith (200-92, college: St.Vincent) who led his team to a victory scoring 26 points and 5 rebounds. Adrian Tomada helped adding 16 points and 9 assists (went 10 for 10 at the free throw line !!!). The best for the losing side was B Symons with 24 points and 6 rebounds and American forward Christopher Kaba (203-88, college: N.Colorado) produced a double-double by scoring 16 points and 10 rebounds. Cougars are looking forward to face Cavaliers in Cranbourne in the next round and it will be quite challenging to get another victory. Thunder will play at home against Stingrays (#8) and is hoping to prove to their supporters that this time they can win. Very significant was Hume City Broncos' (#6) 23-point road victory against Stingrays in League 114-91. Hume City Broncos shot 41 for 58 from the free-throw line, while Stingrays only scored twelve points from the stripe. They outrebounded Stingrays 49-36 including a 18-7 advantage in offensive rebounds. Stingrays were plagued by 38 personal fouls down the stretch. It was an exceptional evening for naturalized American forward Jake Martin (198-93, college: Luther) who led the winners with a double-double by scoring 21 points and 16 rebounds. American swingman Jamal Shabazz (198-94, college: Samford) accounted for 21 points and 13 rebounds for the winning side. American center Joe Reid (205-91, college: Shaw) came up with a double-double by scoring 31 points and 11 rebounds and the other American import guard Ivory Young (190-95, college: Utah Valley) added 18 points, 5 rebounds and 6 assists respectively for Stingrays in the defeat. Both teams had four players each who scored in double figures. The winner was already known earlier in the game, so both coaches allowed to play the bench players saving starting five for next games. Hume City Broncos will play against Gulls (#7) in Melbourne in the next round. Stingrays will play on the road against Thunder in Melbourne and hope to get finally their first victory. Quite upsetting was Vikings' (#1) 29-point home defeat in a game versus Cavaliers who smashed hosts They dominated down low during the game scoring 54 of its points in the paint compared to Vikings' 28. Cavaliers looked well-organized offensively handing out 24 assists comparing to just 10 passes made by Vikings' players. The best player for the winners was American forward Raheem Lemons (196-93, college: Central State) who had a double-double by scoring 24 points and 11 rebounds. Naturalized British forward Matthew Donlan (201, college: Youngstown St.) chipped in 20 points and 5 rebounds. Four Cavaliers players scored in double figures. At the other side the best for losing team was guard Jake Heath (185, college: S.Dakota Mines) who recorded 27 points and 9 rebounds and Michael D'Agostino added 7 points and 9 rebounds respectively. Since the result was very predictable, it gave the chance for the coaches to test many bench players which allowed the starters a little rest for the next games. Cavaliers will meet at home Devils (#9) in the next round and are hoping to win another game. Vikings will play against Magic in Hawthorn and look forward to get finally their first victory. And what about another game where Magic (#5) beat Gulls 90-82 on the road. It was a good game for Patrick McBrearty who led his team to a victory with 26 points. American guard Nelson Kirksey (190-89, college: UMKC) contributed with 17 points and 6 rebounds for the winners. American Corey Standerfer (201-88, college: York, NE) answered with a double-double by scoring 24 points, 14 rebounds and 7 assists and guard Mitchell Riggs (196-93, college: Newberry) added 14 points and 8 rebounds in the effort for Gulls. Both teams had four players each who scored in double figures. Gulls' coach rotated ten players in this game, but that didn't help. Magic's next round opponent will be Vikings (#6) in Melbourne. Gulls will play on the road against Hume City Broncos in Tullamarine and look forward to get finally their first victory. There was an upset in Melbourne where Devils (0-1) were crushed by Thunder (1-1) 92-64 on Sunday. Thunder had a 37-25 advantage in offensive rebounds. It was a great evening for American guard Mike Anderson (193-91, college: Washington) who led his team to a victory with a double-double by scoring 25 points, 12 rebounds and 5 assists. Matt Spencer helped adding 15 points and 4 assists. Thunder's coach felt very confident that he used 10 players and allowed the starting five to rest. The best for the losing side was American David Shepard (201-94, college: Lindenwood-Bellev.) with a double-double by scoring 18 points and 10 rebounds and Maltese guard Jacob Formosa (188-97) scored 22 points. Thunder will face Stingrays (#8) in Geelong in the next round. Devils will play on the road against Cavaliers in Cranbourne and look forward to get finally their first victory. Rather predictable result in Park Holme where West Adelaide Bearcats (3-0) smashed South Adelaide Panthers (0-2) 95-66 on Saturday. West Adelaide Bearcats dominated down low during the game scoring 64 of its points in the paint compared to South Adelaide Panthers' 32. They outrebounded South Adelaide Panthers 47-27 including a 39-20 advantage in defensive rebounds. Great defensive blocking was one of the keys in this match when West Adelaide Bearcats made 8 blocks. It was a great evening for guard Patrick Thomas (190, college: Mary) who led his team to a victory scoring 22 points and 7 rebounds. American forward Bryan Jefferson (201-94, college: Mary) helped adding 22 points and 7 rebounds. The best for the losing side was American forward Zach Allmon (203, college: Vanguard) with 24 points and 8 rebounds and Brad Jonnek scored 11 points, 7 rebounds and 5 assists. Since the result was very predictable, it gave the chance for the coaches to test many bench players and allowed the starting five to rest. West Adelaide Bearcats will face Norwood Flames in Marden in the next round and it will be for sure the game of the week. South Adelaide Panthers will play at home against Woodville Warriors (#10) and look forward to get finally their first victory. Not a big story in a game in Mt Gambier where Noarlunga City Southern Tigers (0-2) were defeated by Mount Gambier Pioneers (2-1) 108-99 on Saturday. Mount Gambier Pioneers made 24-of-27 free shots (88.9 percent) during the game. They looked well-organized offensively handing out 31 assists. It was a great evening for the former international guard Tom Daly (182-91) who led his team to a victory scoring 40 points (!!! ), 7 rebounds and 8 assists (went 7 for 7 at the free throw line). Guard Sam Daly (193-95, college: Chaminade) helped adding 23 points, 5 rebounds and 6 assists (went 7 for 7 at the free throw line). Four Mount Gambier Pioneers players scored in double figures. The best for the losing side was American swingman CJ Turnage (201-95, college: Saginaw Valley) with 34 points (!!! ), 8 rebounds and 4 assists and the former international swingman Anthony Drmic (198-92, college: Boise St.) produced a double-double by scoring 27 points, 10 rebounds and 6 assists. Noarlunga City Southern Tigers' coach tested ten players, but that didn't help to avoid defeat in this game. Mount Gambier Pioneers will have a break next round. Noarlunga City Southern Tigers will play at home against Central District Lions (#6) and look forward to get finally their first victory. Eastern Mavericks used a home court advantage and beat the opponent from Flinders Park 94-77 on Saturday night. Eastern Mavericks outrebounded Woodville Warriors 53-35 including a 37-23 advantage in defensive rebounds. Woodville Warriors were plagued by 27 personal fouls down the stretch. It was a great evening for center Devon McGee (205-97) who led his team to a victory with a double-double by scoring 19 points, 13 rebounds and 5 assists. American guard Novian Cherry (193-92, college: CS San Marcos) helped adding 15 points and 16 rebounds. Four Eastern Mavericks players scored in double figures. The best for the losing side was power forward Alex Maiorana with 14 points and 7 rebounds and guard Riley Meldrum scored 15 points. Both coaches used bench players and allowed the starting five to rest. Eastern Mavericks will face Sturt Sabres (#11) in Pasadena in the next round. Woodville Warriors will play on the road against South Adelaide Panthers in Park Holme and look forward to get finally their first victory. There was no surprise in Gawler where Central District Lions (1-1) were outplayed by Forestville Eagles (3-0) 138-82 on Saturday. Forestville Eagles shot 62.2 percent from the field and made 34-of-43 free shots (79.1 percent) during the game, while Central District Lions only scored fourteen points from the stripe. Forestville Eagles shot the lights out from three sinking 12 long-distance shots on high 60.0 percentage. They looked well-organized offensively handing out 29 assists comparing to just 15 passes made by Central District Lions' players. Central District Lions were plagued by 29 personal fouls down the stretch. It was a great evening for South Sudanese forward Majok Deng (208-93, college: La-Monroe) who led his team to a victory scoring 24 points, 7 rebounds and 5 assists. Guard Brendan Teys (188-90) helped adding 20 points and 6 assists. Four Forestville Eagles players scored in double figures. The best for the losing side was Apiok Dau with 14 points and 5 rebounds and Isaac Atuer scored 14 points. Since the result was very predictable, it gave the chance for the coaches to test many bench players and allowed the starting five to rest. Forestville Eagles will face North Adelaide Rockets (#4) in Greenacres in the next round. Central District Lions will play on the road against Noarlunga City Southern Tigers in Morphett Vale and hope to win that game. No shocking result in a game in Marden where Norwood Flames (4-0) edged North Adelaide Rockets (2-1) 82-81 on Saturday. It was a great evening for guard Andrew Webber (180-85, college: Armstr.Atlantic) who led his team to a victory scoring 20 points and 4 assists. American guard James Legan (190-87, college: E.Carolina, agency: Court Side) helped adding 16 points, 6 rebounds and 4 assists. Five Norwood Flames players scored in double figures. The best for the losing side was the former international forward Jack McVeigh (203-96, college: Nebraska) with 27 points and 8 rebounds and American forward Alexander Starling (198-89, college: Beth.-Cookman) scored 17 points and 9 rebounds. Norwood Flames will face West Adelaide Bearcats (#3) in Woodville in the next round, which may be the game of the day. North Adelaide Rockets will play at home against Forestville Eagles and it may be a tough game between close rivals. Very expected game in Woodville where Sturt Sabres (0-4) were defeated by West Adelaide Bearcats (3-0) 90-76 on Sunday. West Adelaide Bearcats dominated down low during the game scoring 58 of its points in the paint compared to Sturt Sabres' 24. They outrebounded Sturt Sabres 52-31 including a 34-20 advantage in defensive rebounds. It was a great evening for Shane Hayward who led his team to a victory with a double-double by scoring 20 points, 11 rebounds and 4 blocks. American forward Bryan Jefferson (201-94, college: Mary) helped adding 19 points and 12 rebounds. Five West Adelaide Bearcats players scored in double figures. West Adelaide Bearcats' coach used a ten-player rotation and allowed the starting five to rest. The best for the losing side was Daniel Nash with 21 points and forward Rigby Aktanarowicz scored 6 points and 10 rebounds. West Adelaide Bearcats will face Norwood Flames in Marden in the next round and it will be for sure the game of the week. Sturt Sabres will play at home against Eastern Mavericks (#7) and look forward to get finally their first victory. There was a surprise result in Kalamunda where Giants (1-1) smashed Suns (1-1) 98-65 on Sunday. Giants dominated down low during the game scoring 64 of its points in the paint compared to Suns' 38. Giants forced 19 Suns turnovers. They looked well-organized offensively handing out 22 assists. It was a great evening for swingman David Humphries (193-91, college: Loyola Mary) who led his team to a victory scoring 35 points (!!!) and 6 rebounds. 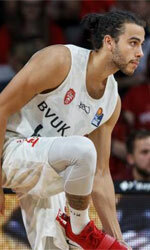 Forward Manylok Malek (201-94) helped adding 15 points and 11 rebounds. The best for the losing side was American swingman Joshua Braun (193-94, college: Grand Canyon) with 21 points and 8 rebounds and power forward Louis Timms (206-91, college: Wayland Baptist) scored 8 points and 11 rebounds. Since the result was very predictable, it gave the chance for the coaches to test many bench players and allowed the starting five to rest. Giants will face Redbacks (#11) in Northbridge in the next round. Suns will play at home against Magic and hope to win that game. Not a big story in a game in Floreat where Hawks (0-1) were rolled over by Wanneroo (2-0) 112-76 on Friday. Wanneroo had a 32-20 advantage in offensive rebounds. They looked well-organized offensively handing out 22 assists. Hawks were plagued by 31 personal fouls down the stretch. It was a great evening for Guamanian-American guard Earnest Ross (198-91, college: Missouri, agency: Haylett Sports) who led his team to a victory scoring 25 points, 5 rebounds and 8 assists (on 10-of-13 shooting from the field). Filipino swingman Sebestian Salinas (188-85) helped adding 16 points (perfect behind the arc making all five shots). The best for the losing side was American center Brian Carlwell (211-87, college: San Diego St.) with 9 points, 11 rebounds and 4 assists and guard Mitchell Clarke (185-99) scored 13 points and 5 assists. Since the result was very predictable, it gave the chance for the coaches to test many bench players and allowed the starting five to rest. Wanneroo will face Senators (#5) in Perth in the next round. Hawks will play on the road against Flames (#12) in Rockingham and look forward to get finally their first victory. Everything went according to plan in North Lake where Lightning (1-0) edged Magic (0-2) 80-77 on Friday. However just three-point win is not that big difference and the fans of host team counted on more convincing victory. Lightning outrebounded Magic 50-36 including 20 on the offensive glass. It was a great evening for center Jarrad Prue (198-82) who led his team to a victory scoring 6 points and 28 rebounds. Guard Kyle Armour (183-89, college: Augusta) helped adding 19 points and 5 rebounds. Four Lightning players scored in double figures. The best for the losing side was American guard Shaun Stewart (183-94, college: Limestone) with 32 points, 9 rebounds and 6 assists and the other American import forward Marvin Smith (201-93, college: USC Upstate) scored 11 points and 9 rebounds. Magic's coach tested ten players, but that didn't help to avoid defeat in this game. Lightning will face Tigers (#6) in Willetton in the next round. Magic will play on the road against Suns (#8) in Kalamunda and looks forward to get finally their first victory. But Cougars were not able to use a home court advantage and were defeated by the opponent from Willetton 90-81 on Saturday night. Tigers dominated down low during the game scoring 72 of its points in the paint compared to Cougars' 36. They outrebounded Cougars 52-37 including 18 on the offensive glass. It was a great evening for guard Jackson Hussey (190-92, college: Pikeville) who led his team to a victory scoring 24 points, 7 rebounds and 6 assists. Guard Damien Scott (192-92) helped adding 13 points, 8 rebounds and 4 assists. Five Tigers players scored in double figures. The best for the losing side was swingman Gavin Field (202-89, college: W.Georgia) with a double-double by scoring 36 points (!!!) and 14 rebounds (went 12 for 12 at the free throw line !!!) and forward Jaarod Holmes (198-94) scored 11 points and 8 rebounds. Both coaches used bench players and allowed the starting five to rest. Tigers will face Lightning (#4) in North Lake in the next round and it will be quite challenging to get another victory. Cougars will play on the road against Eagles (#2) in Morley and look forward to get finally their first victory. Buccaneers used a home court advantage and won against the opponent from Rockingham 86-70 on Saturday night. Buccaneers dominated down low during the game scoring 58 of its points in the paint compared to Flames' 30 and made 19-of-25 free shots (76.0 percent) during the game. Buccaneers forced 24 Flames turnovers and outrebounded them 55-38 including a 26-8 advantage in offensive rebounds. It was a great evening for New Zealand forward Brayden Inger (203-99) who led his team to a victory with a double-double by scoring 26 points and 12 rebounds. American-Tongan guard Marcus Alipate (182-92, college: St.Thomas) helped adding 15 points and 6 assists. Four Buccaneers players scored in double figures. The best for the losing side was guard Ryan Godfrey (187-90, college: W.Georgia) with 13 points and 8 assists and American power forward Josh Ritchart (205-92, college: Cal-Davis) scored 15 points and 8 rebounds. Both coaches used bench players and allowed the starting five to rest. Buccaneers will face Slammers (#13) in Bunbury in the next round and are hoping to win another game. Flames will play at home against Hawks and look forward to get finally their first victory. Wanneroo used a home court advantage and beat the opponent from Kalgoorlie 91-83 on Saturday night. Wanneroo made 18-of-23 free shots (78.3 percent) during the game. It was a great evening for Guamanian-American guard Earnest Ross (198-91, college: Missouri, agency: Haylett Sports) who led his team to a victory with a double-double by scoring 25 points, 15 rebounds and 5 assists. American swingman Ridell Camidge (192-96, college: Oklahoma City) helped adding 32 points. Wanneroo's coach used entire bench and allowed the starting five to rest. The best for the losing side was American forward Patrick Burke (201-96, college: Dallas Baptist) with 24 points and 8 rebounds and the other American import swingman Jay Bowie (196-92, college: Marist) scored 15 points, 9 rebounds and 4 assists. Four Giants players scored in double figures. Wanneroo will face Senators (#5) in Perth in the next round. Giants will play at home against Redbacks and hope to win that game. But Slammers were not able to use a home court advantage and lost to the opponent from Morley 108-98 on Saturday night. Eagles forced 19 Slammers turnovers. Great defensive blocking was one of the keys in this match when Eagles made 8 blocks. It was a great evening for forward Andrej Donlagic (197-97) who led his team to a victory scoring 23 points and 6 rebounds. Swingman Drew Williamson (196-83, college: MSU Denver) helped adding 19 points, 6 rebounds and 4 blocks. Eagles' coach used a ten-player rotation and allowed the starting five to rest. The best for the losing side was American swingman Tyler Livingston (198-94, college: Mass.-Lowell) with a double-double by scoring 33 points (!!!) and 12 rebounds and the other American import guard Michael Lay (179-84, college: Concordia, OR) scored 19 points, 6 rebounds, 9 assists and 4 steals. Four Slammers players scored in double figures. Eagles will face Cougars (#9) in Hamilton Hill in the next round and are hoping to win another game. Slammers will play on the road against Buccaneers (#3) in Wonthella and look forward to get finally their first victory. But Magic was not able to use a home court advantage and was defeated by the opponent from Kalamunda 82-75 on Saturday night. Magic was plagued by 24 personal fouls down the stretch. It was a great evening for power forward Louis Timms (206-91, college: Wayland Baptist) who led his team to a victory with a double-double by scoring 18 points, 13 rebounds, 5 assists and 4 blocks. American swingman Joshua Braun (193-94, college: Grand Canyon) helped adding 28 points. Four Suns players scored in double figures. The best for the losing side was American guard Shaun Stewart (183-94, college: Limestone) with 36 points (!!!) and 6 assists and power forward Akau Deng (205-93, college: N.Platte CC) scored 7 points and 12 rebounds. Suns will have a break next round. Magic will play again on the road against Suns (#8) in Kalamunda and looks forward to get finally their first victory. But Redbacks were not able to use a home court advantage and were outscored by the opponent from Perth 96-61 on Saturday night. Senators forced 20 Redbacks turnovers and had a 32-21 advantage in offensive rebounds. They looked well-organized offensively handing out 25 assists. It was a great evening for American guard Justin King (196-89, college: TRU) who led his team to a victory scoring 23 points, 9 rebounds and 4 assists. Forward Caleb Davis (206-95, college: Saginaw Valley) helped adding 23 points and 6 rebounds. Five Senators players scored in double figures. The best for the losing side was forward Majier Garang (200-95) with 10 points and 8 rebounds and American forward David Swaby (198-83) scored 10 points. Since the result was very predictable, it gave the chance for the coaches to test many bench players and allowed the starting five to rest. Senators will face Wanneroo in Joondalup in the next round and it will be quite challenging to get another victory. Redbacks will play on the road against Giants (#7) in Kalgoorlie and look forward to get finally their first victory. Crusaders' road win over Canberra Gunners 74-59 was very exciting. They outrebounded Canberra Gunners 50-33 including 35 on the defensive glass. It was a great evening for American forward Mitchell Rueter (198, college: Cent.Arkansas) who led his team to a victory with a double-double by scoring 26 points and 11 rebounds. Jacob Cracknell helped adding 9 points and 7 rebounds. The best for the losing side was American forward Nicholas Jackson (193, college: Purchase) with 16 points and center Iain Morison (206-95, college: St.Francis, IL) scored 8 points and 8 rebounds. Canberra Gunners' coach tested ten players and allowed the starting five to rest. Crusaders will face Sutherland Sharks (#6) at home in the next round which should be theoretically an easy game. Canberra Gunners will play against Manly Warringah Sea Eagles and hope to win that game. There was no surprise in Penrith where Newcastle Hunters (0-2) were edged by Panthers (2-0) 65-62 on Saturday. However just three-point win is not that big difference and the fans of host team counted on more convincing victory. It was a great evening for forward Sean Weekes (194) who led his team to a victory with a double-double by scoring 13 points and 17 rebounds. Lachlan Charlton helped adding 14 points and 6 rebounds. Panthers' coach used entire bench in such tough game. The best for the losing side was American forward Sharif Watson (198-93, college: Ariz.Christian) with a double-double by scoring 20 points, 18 rebounds, 4 assists and 4 blocks and the other American import power forward Lonnie Funderburke (203-88, college: Tennessee St.) produced a double-double by scoring 12 points and 10 rebounds. Panthers will face Bankstown Bruins (#9) in Condell Park in the next round which should be theoretically an easy game. Newcastle Hunters will play at home against Sydney City Comets and look forward to get finally their first victory. Bankstown Bruins used a home court advantage and won against the opponent from Hornsby 82-75 on Saturday night. Spiders trailed by 17 points after 3 quarters before a 21-11 run in the last quarter cut the deficit to 75-82 at the end of the game. Bankstown Bruins forced 23 Spiders turnovers. Strangely Spiders outrebounded Bankstown Bruins 46-34 including a 34-22 advantage in defensive rebounds. They looked well-organized offensively handing out 21 assists. It was a great evening for Christian Petrovski who led his team to a victory scoring 13 points and 7 rebounds. Forward Jack Lopez (196-94, college: Montana) helped adding 11 points, 5 assists and 7 steals. Four Bankstown Bruins players scored in double figures. The best for the losing side was Lachlan Woodhill with 16 points and 8 rebounds (on 7-of-9 shooting from the field) and Daniel Moser (, college: Northwestern, IA) scored 13 points and 7 rebounds. Both coaches used bench players and allowed the starting five to get some rest. Bankstown Bruins will face Panthers (#3) in Penrith in the next round and it will be quite challenging to get another victory. Spiders will play at home against Norths Soul Sports Bears (#2) where they are definitely not considered as a favorite in this game either. Manly Warringah Sea Eagles used a home court advantage and edged the opponent from Alexandria 80-79 on Saturday night. Sydney City Comets were plagued by 29 personal fouls down the stretch. It was a great evening for Abe Bulgin who led his team to a victory scoring 21 points and 7 rebounds. Guard Steven White (182-90, college: Alaska-Anch.) helped adding 16 points and 6 assists. Four Manly Warringah Sea Eagles players scored in double figures. The best for the losing side was naturalized American guard Indiana Faithfull (193-91, college: W.Liberty St.) with 32 points, 9 rebounds and 4 assists and naturalized British V.Islands guard William McFee (191, college: UNB) scored 17 points. Manly Warringah Sea Eagles will face Canberra Gunners (#4) on the road in the next round and it will be quite challenging to get another victory. Sydney City Comets will play against Newcastle Hunters (#11) in Broadmeadow and look forward to get finally their first victory. There was a surprise result when Sutherland Sharks (1-1) edged at home Maitland Mustangs (1-1) 69-68 on Saturday. It was a great evening for American forward Taj Spencer (201, college: Cal.Baptist) who led his team to a victory with a double-double by scoring 25 points and 17 rebounds. Lochlan Hutchison helped adding 15 points, 7 rebounds and 8 assists. The best for the losing side was American forward Isaiah Ellis (203-95, college: Chico St., agency: Interperformances) with a double-double by scoring 14 points and 11 rebounds and guard Joshua Clifford (196-88) scored 14 points and 7 rebounds. Four Maitland Mustangs players scored in double figures. Maitland Mustangs' coach tried various players' combinations and tested in total eleven players, but that didn't help to avoid defeat in this game. Sutherland Sharks will face Crusaders in Terrigal in the next round and it will be quite challenging to get another victory. Maitland Mustangs will play at home against Norths Soul Sports Bears (#2) and hope to win that game. But Hills Hornets were not able to use a home court advantage and were defeated by the opponent from Crows Nest 70-66 on Saturday night. Norths Soul Sports Bears forced 20 Hills Hornets turnovers. Hills Hornets were plagued by 24 personal fouls down the stretch. It was a great evening for forward Michael Golding (198, college: Adrian) who led his team to a victory with a double-double by scoring 15 points and 12 rebounds. Anatoly Bose helped adding 11 points, 13 rebounds and 4 assists. Four Norths Soul Sports Bears players scored in double figures. The best for the losing side was naturalized British forward Paul Brotherson (198-89, college: MSU Denver) with 15 points and Sam McCorkindale scored 9 points, 12 rebounds and 5 blocks. Both coaches used bench players in such tough game. Norths Soul Sports Bears will face Maitland Mustangs (#5) on the road in the next round. Hills Hornets will play against Maitland Mustangs and it may be a tough game between close rivals.